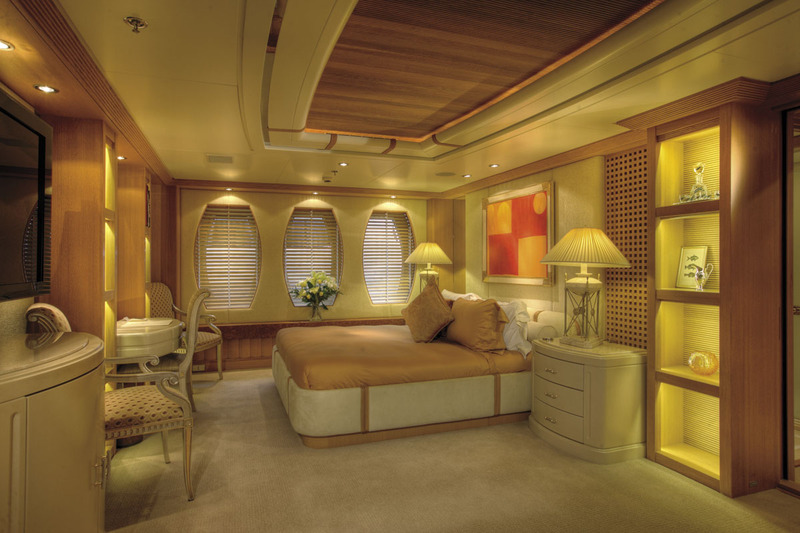 Motor yacht MARLA (ex TJ Esperanza, ThunderGulch) is a 50m (164') Amels built luxury motor yacht with her wonderful interior design by Terence Disdale. 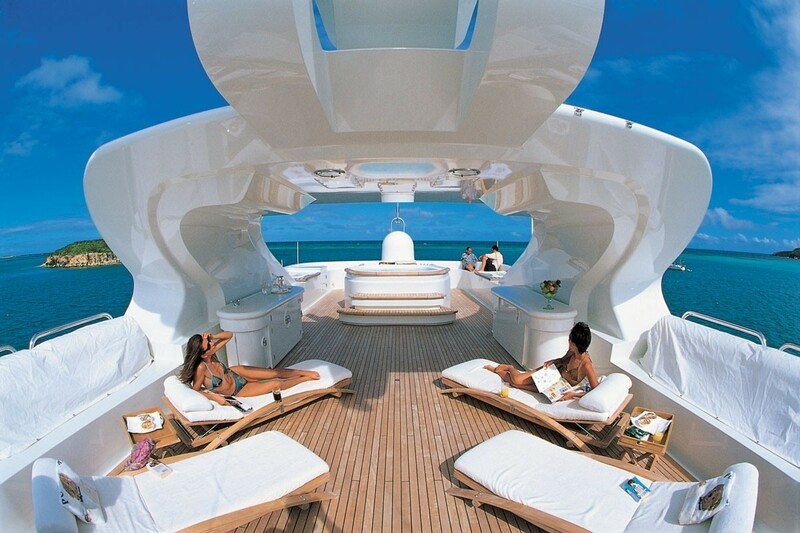 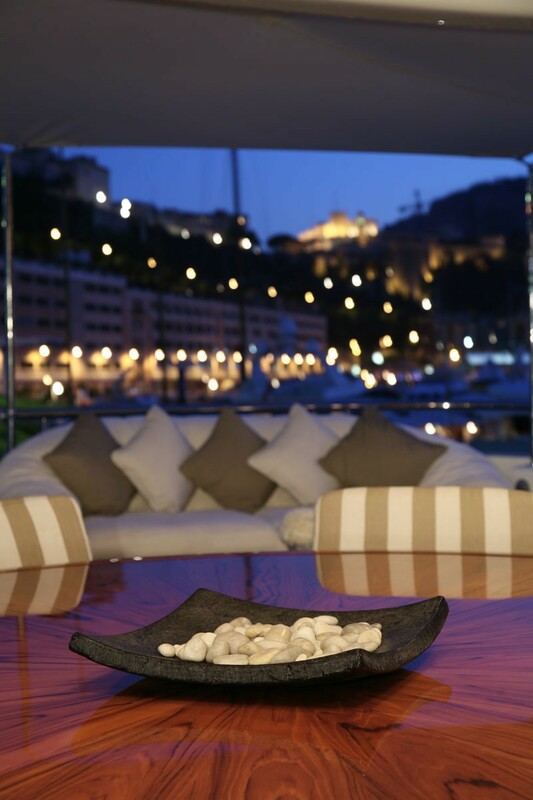 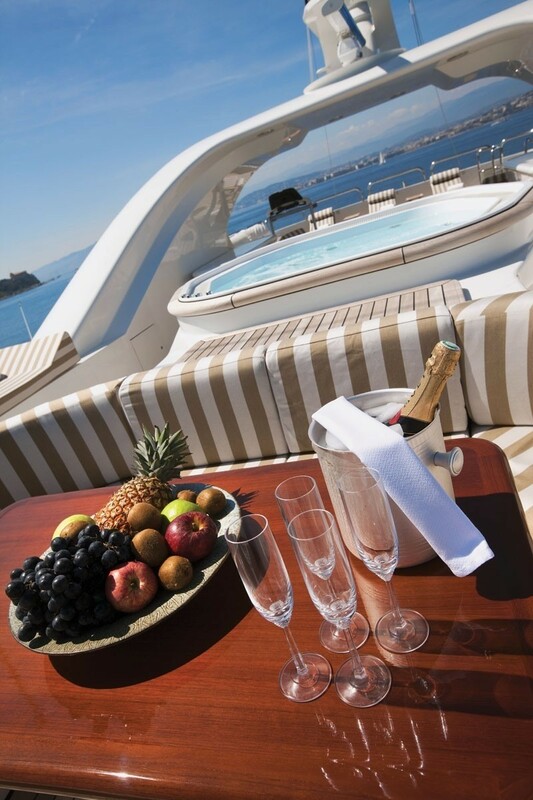 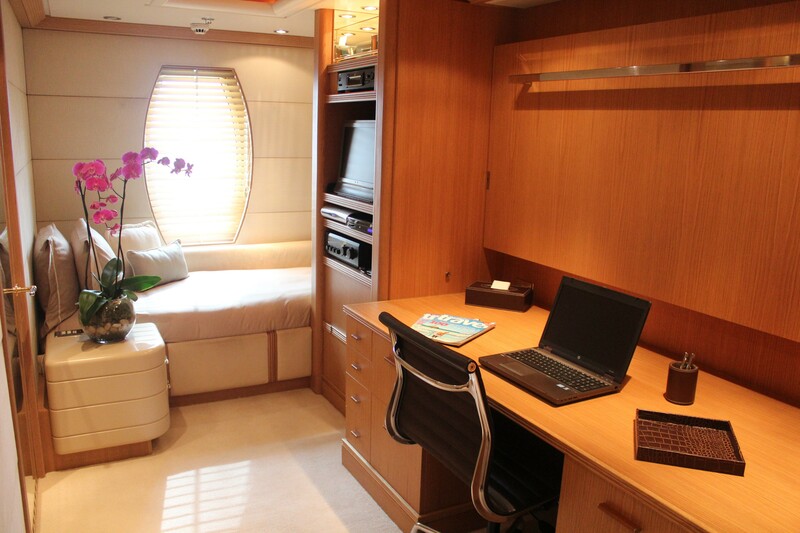 She is a very stylish yacht available for luxury yacht charter for up to 10 guests. 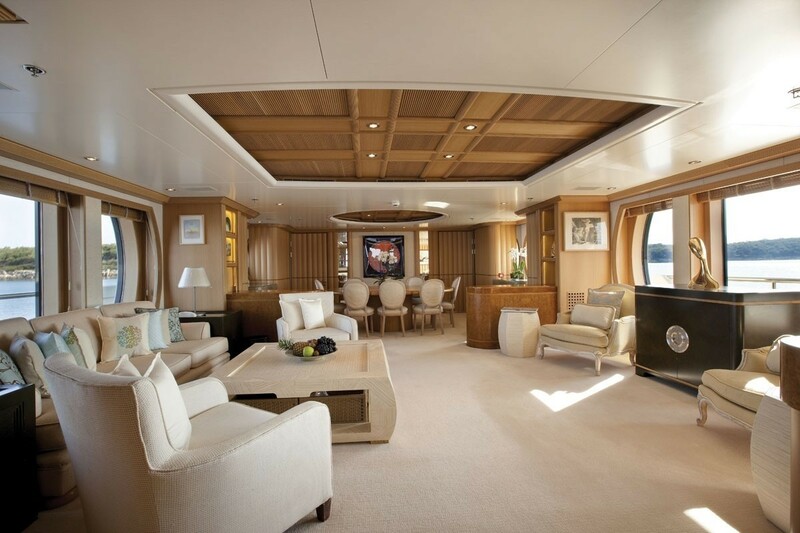 Superyacht MARLA underwent a refit in Palma 2008 and she now has zero speed stabilizers and new wall panelling in her interior. 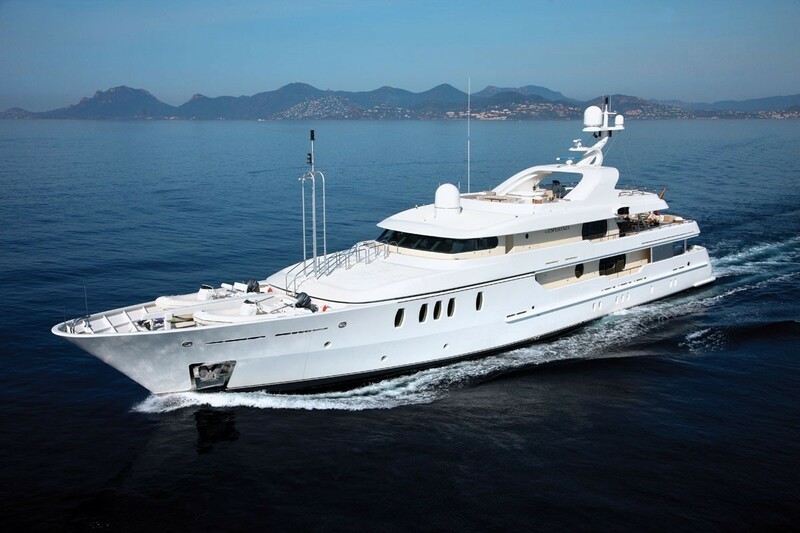 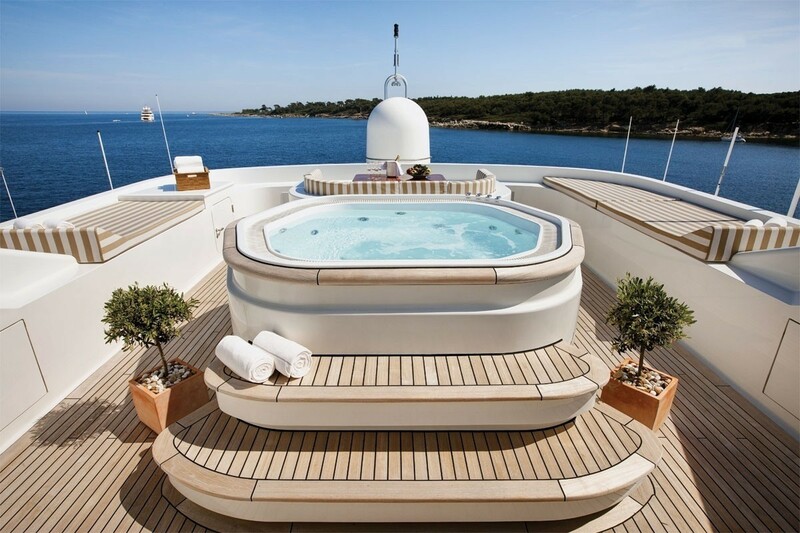 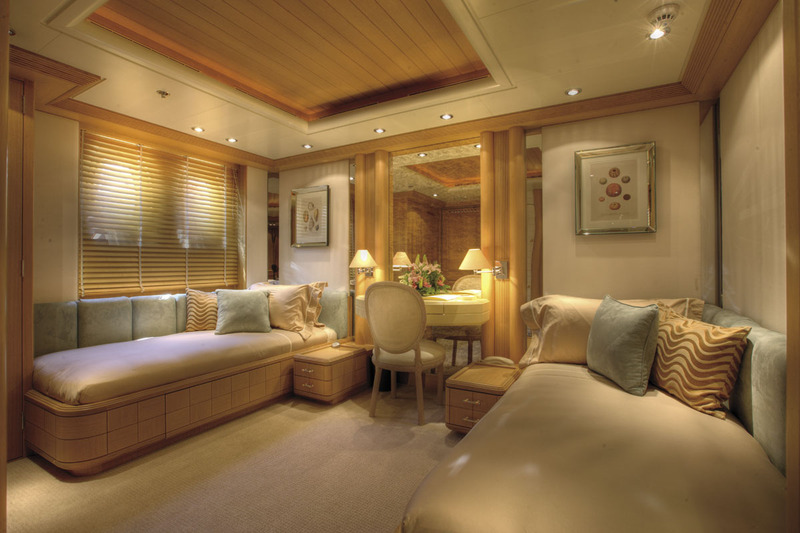 Luxury yacht MARLA (ex TJ Esperanza, Thunder Gulch) is renowned on the charter market for her luxurious comfort. 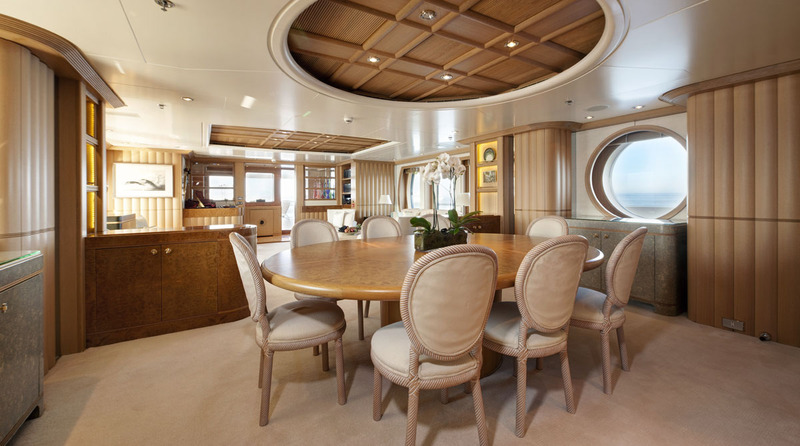 Under new ownership her stunning Disdale interior is crafted in limed oak, offers spacious areas for relaxing and entertaining and boasts some impressive art work. 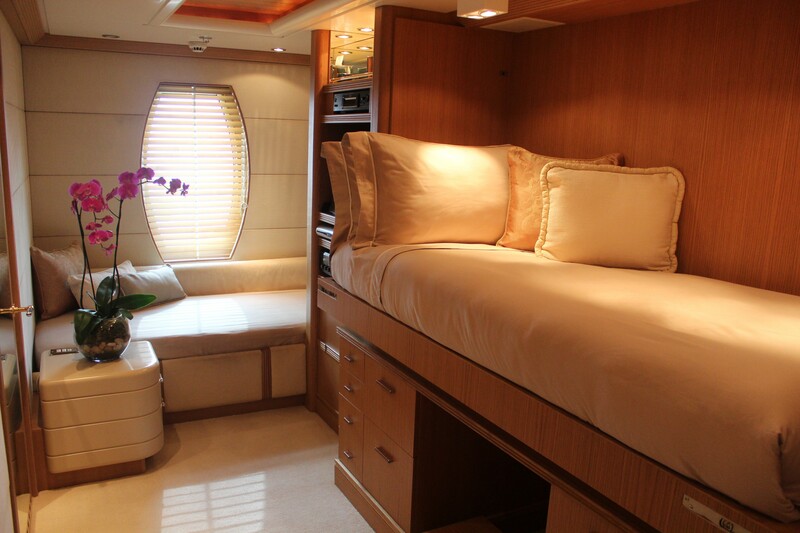 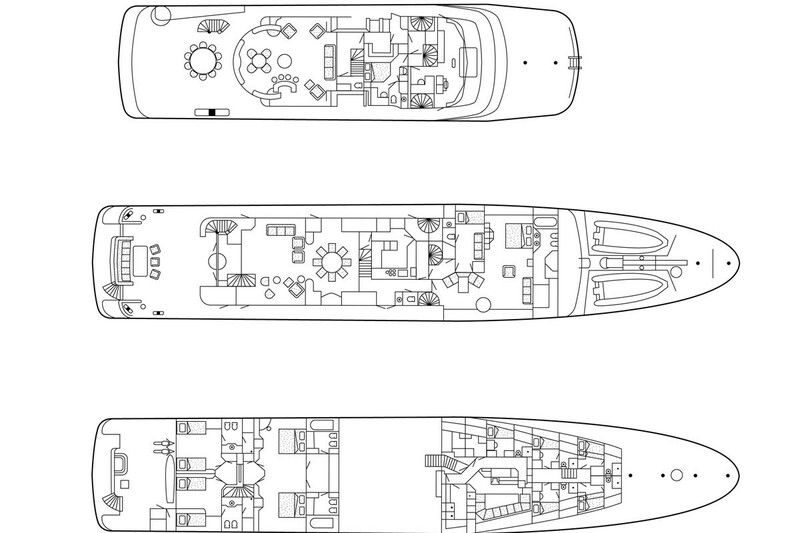 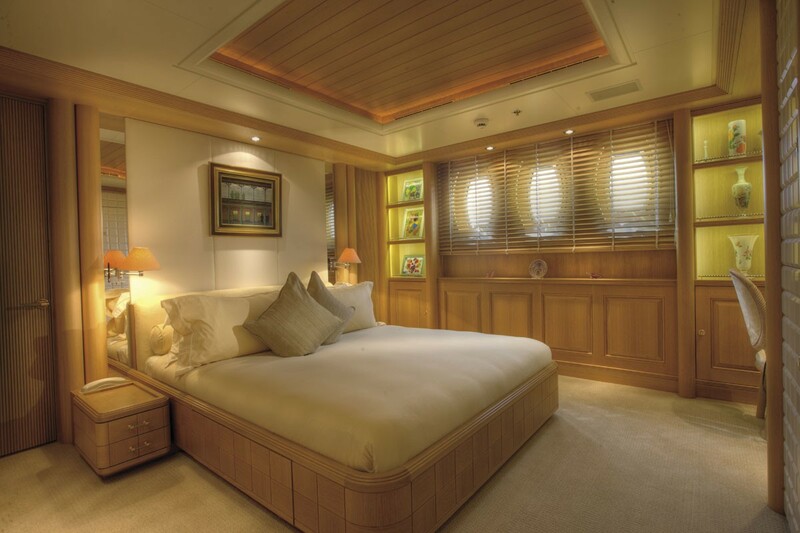 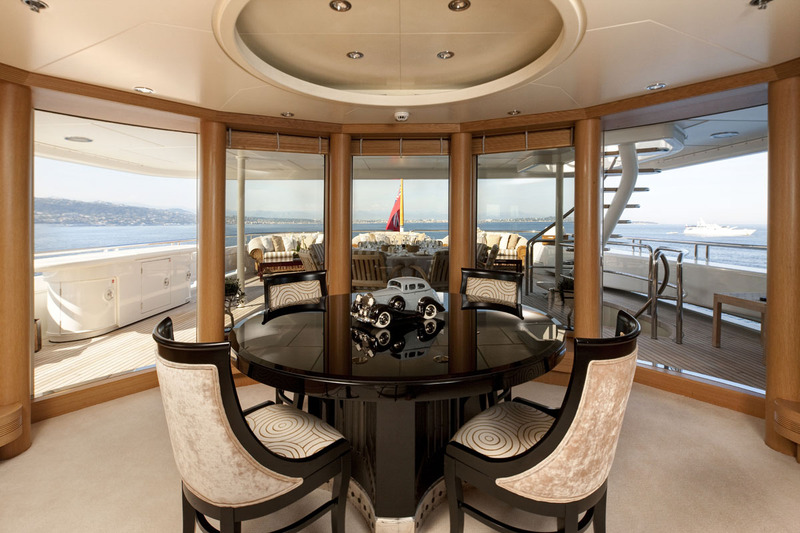 She features a full-width master suite with study etc up on her main deck. 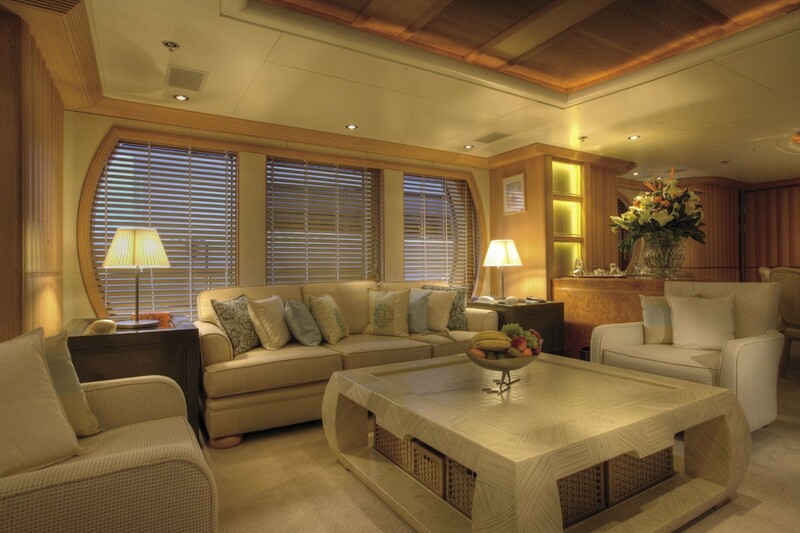 MARLA remains in excellent condition and her interior now boasts new art work creating a more modern style. 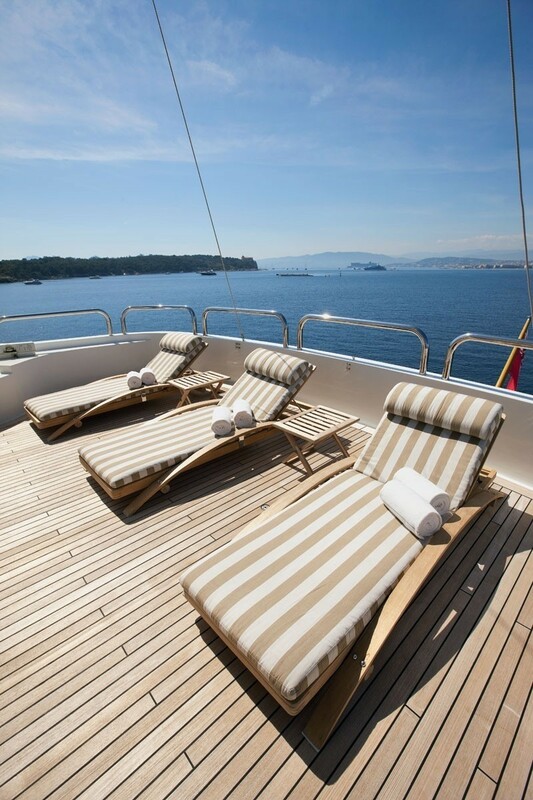 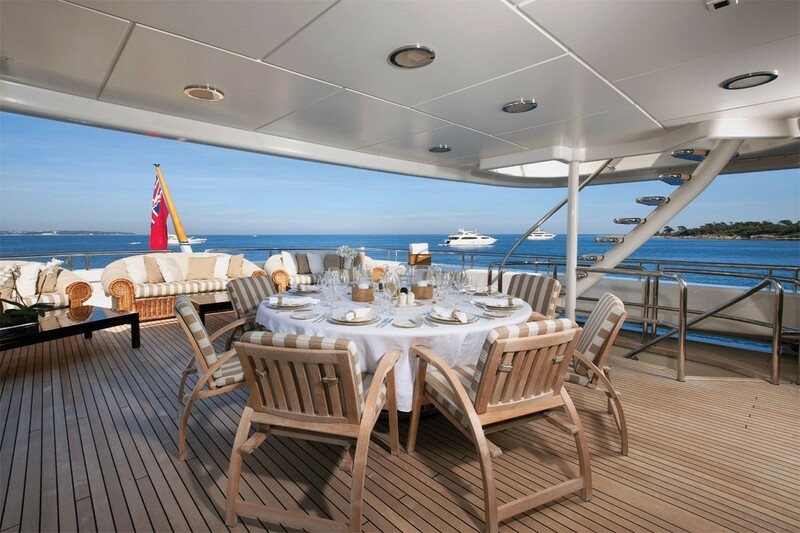 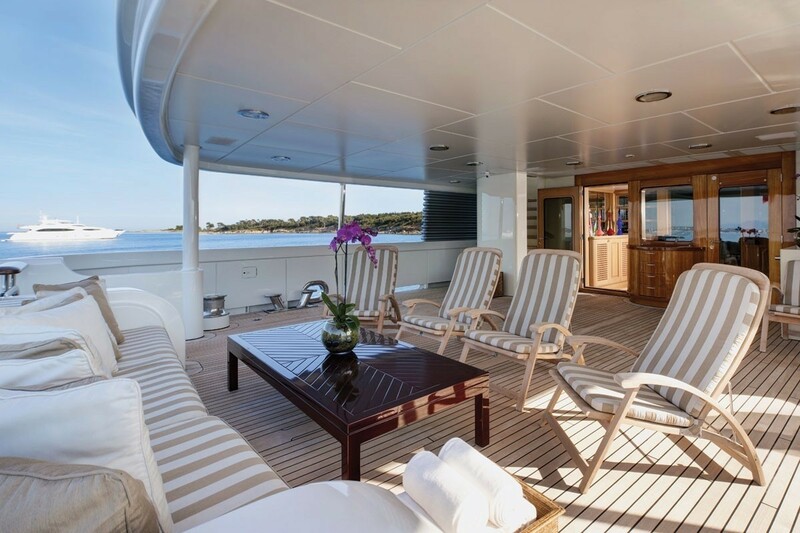 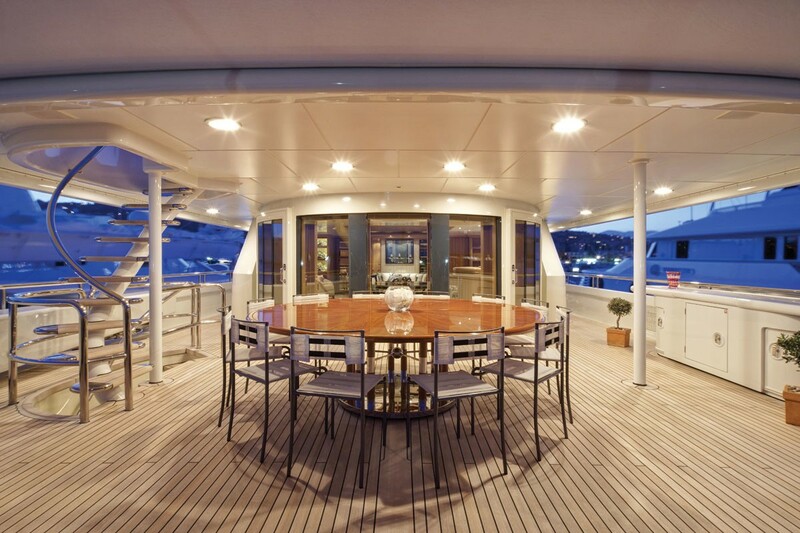 Her generous deck areas enable a range of activities such as sunbathing, relaxing in the Spa Pool, or dining in the shade. 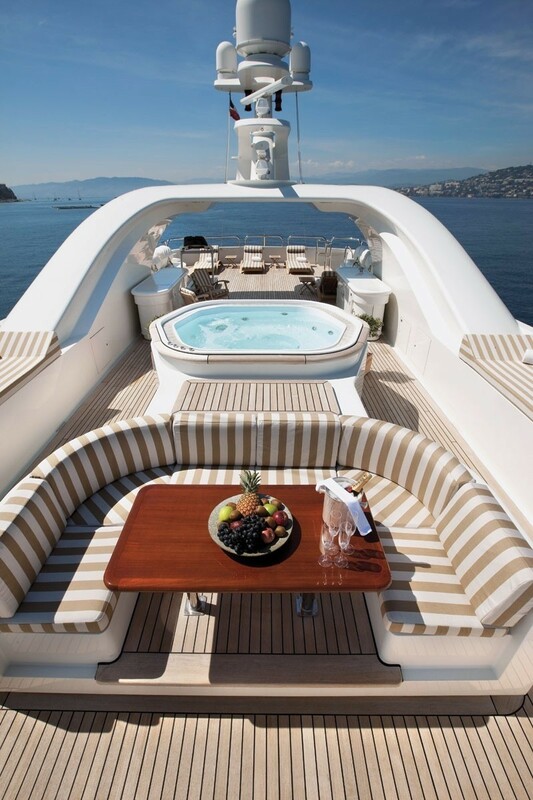 She also offers a long list of water toys. 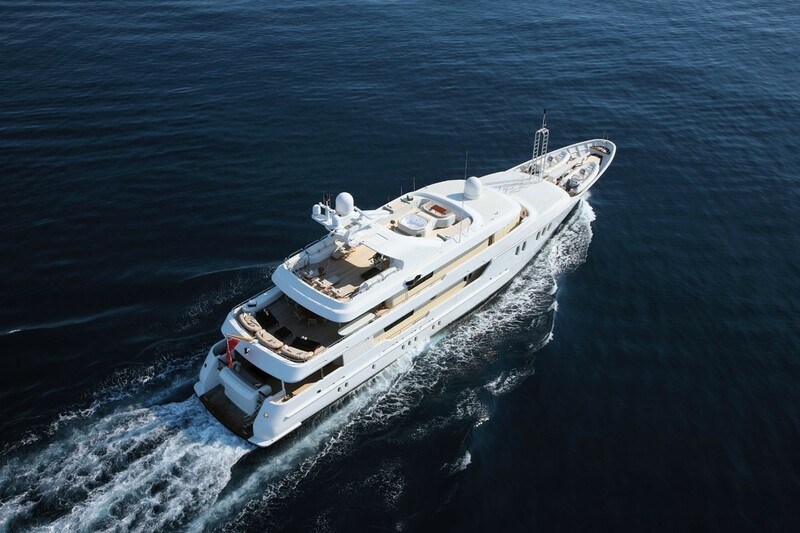 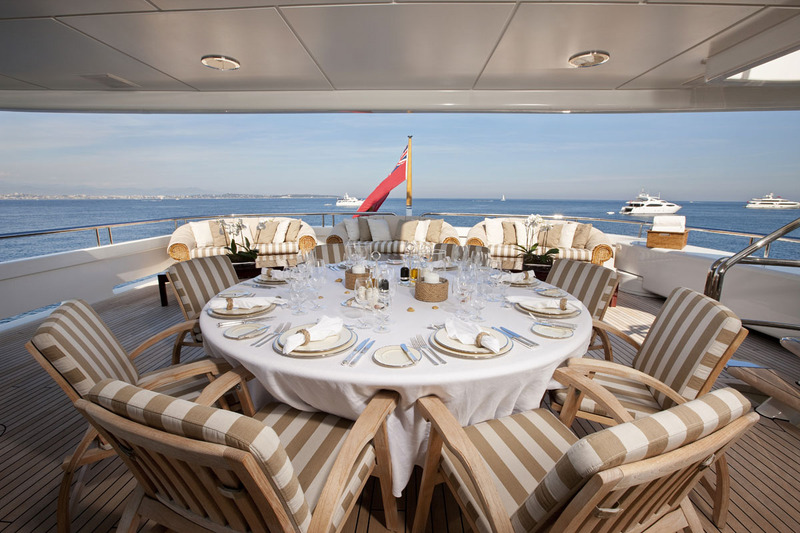 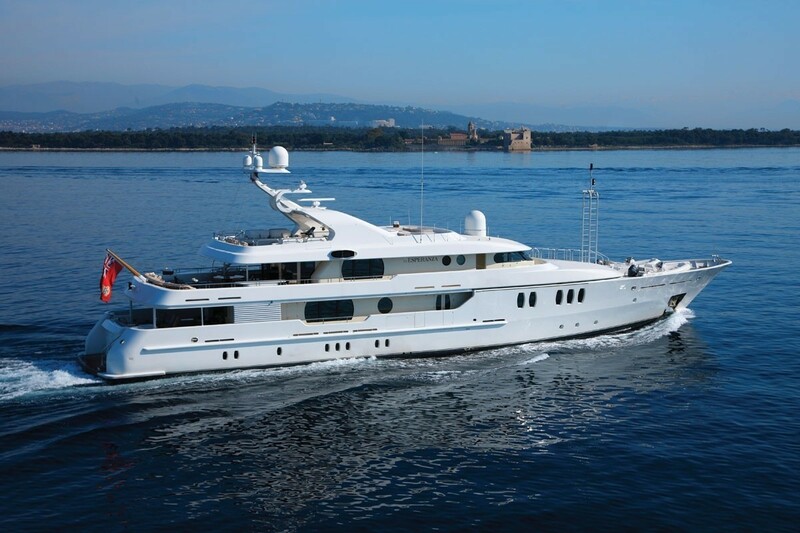 Motor yacht MARLA has accommodation for a total of 11 guests. 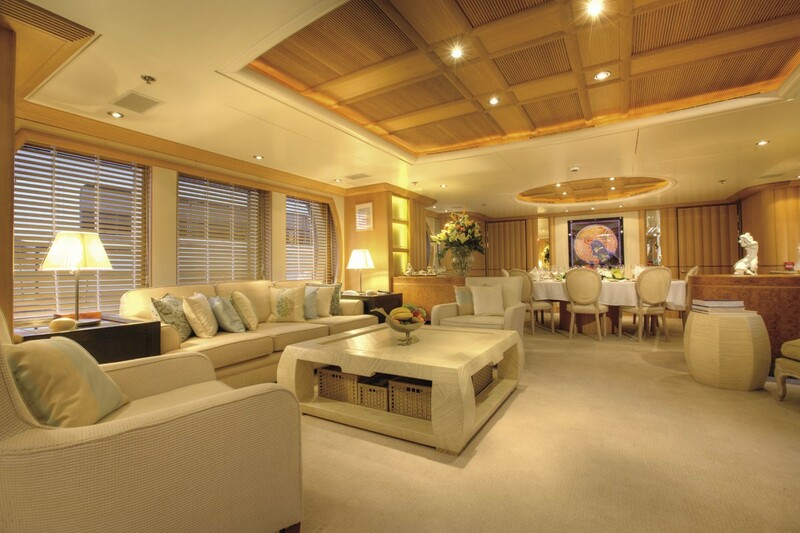 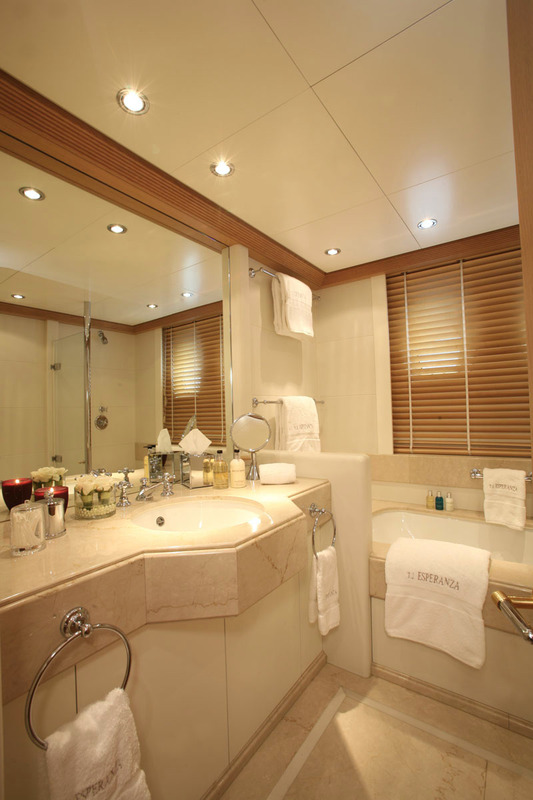 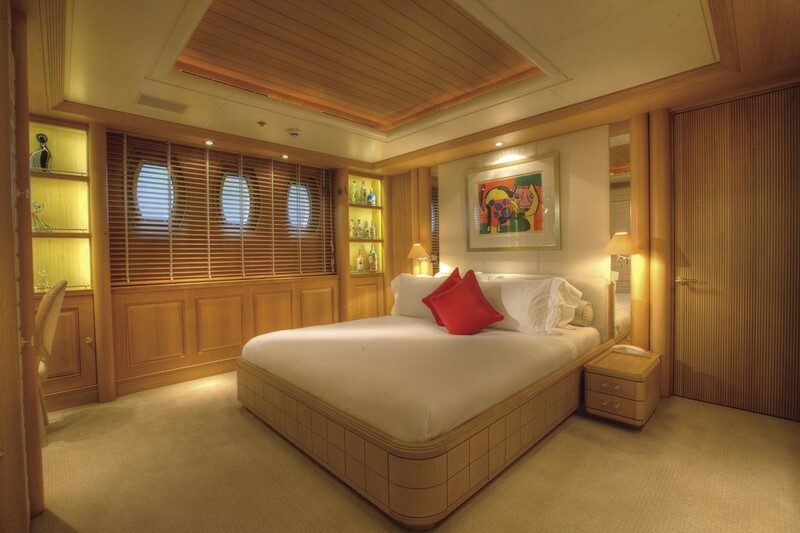 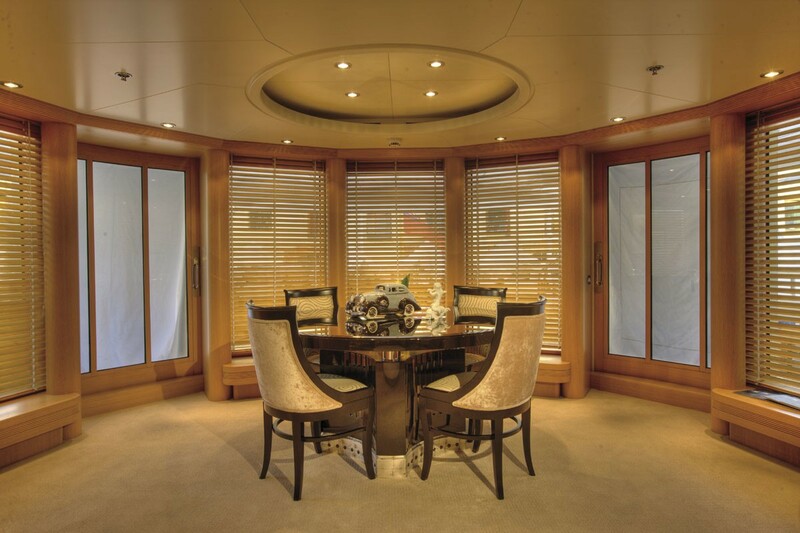 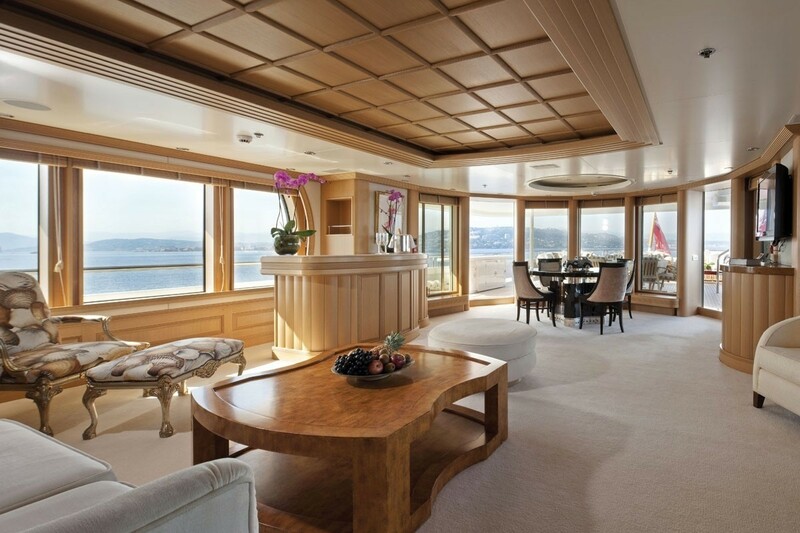 Her full-width master stateroom is located on the main deck. 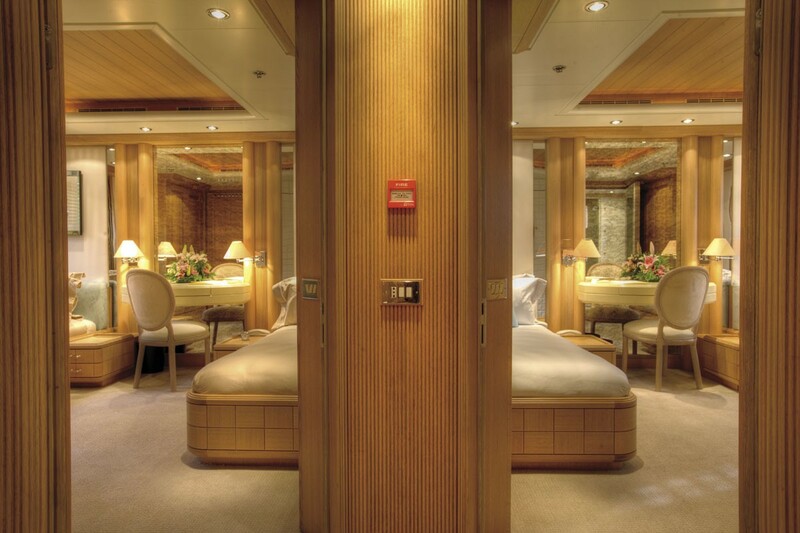 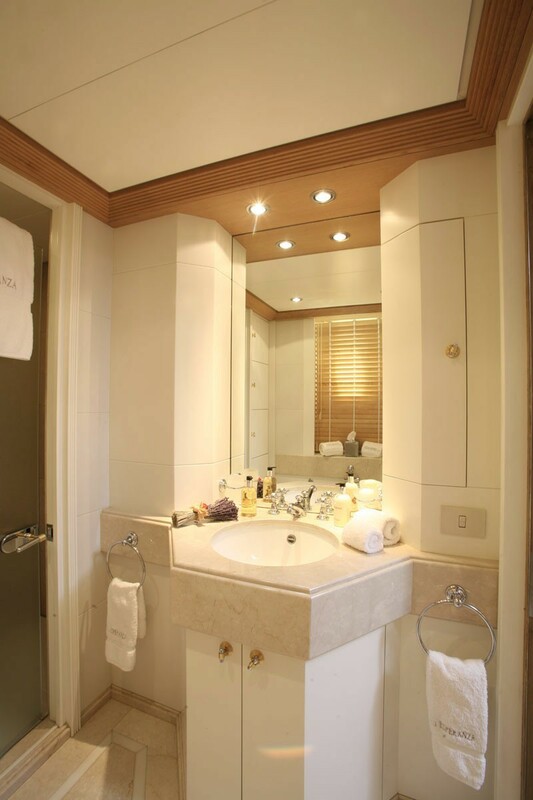 On the lower deck there is two double staterooms with bath and two twin staterooms with showers. 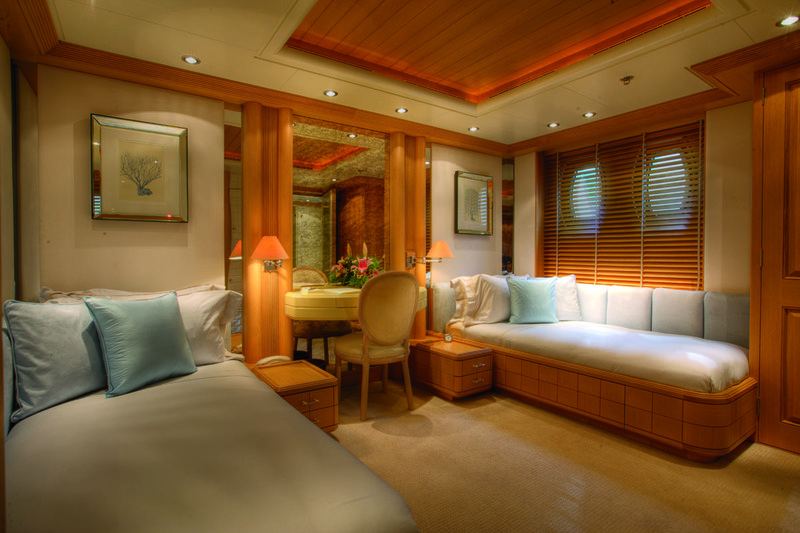 There is a single cabin located aft of the master stateroom with shower and head which is suitable for a child, a nanny or a bodyguard. 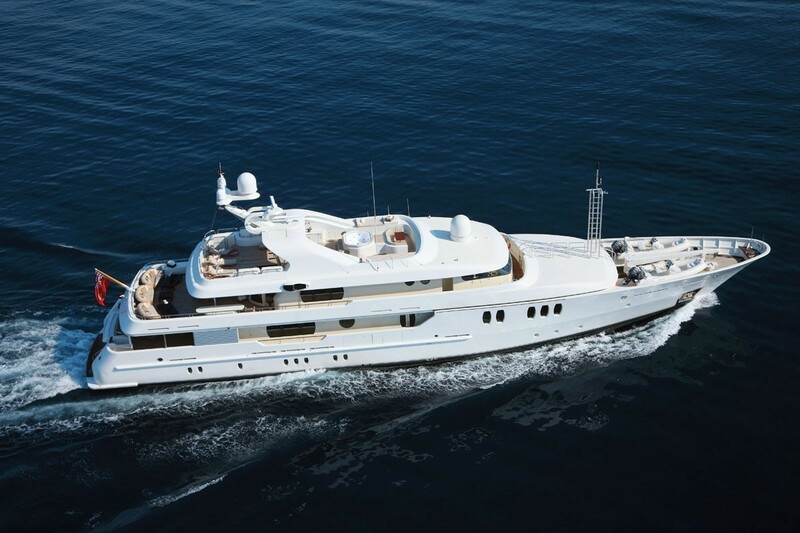 MARLA can cruise with 12 guests and has 12 crew too. 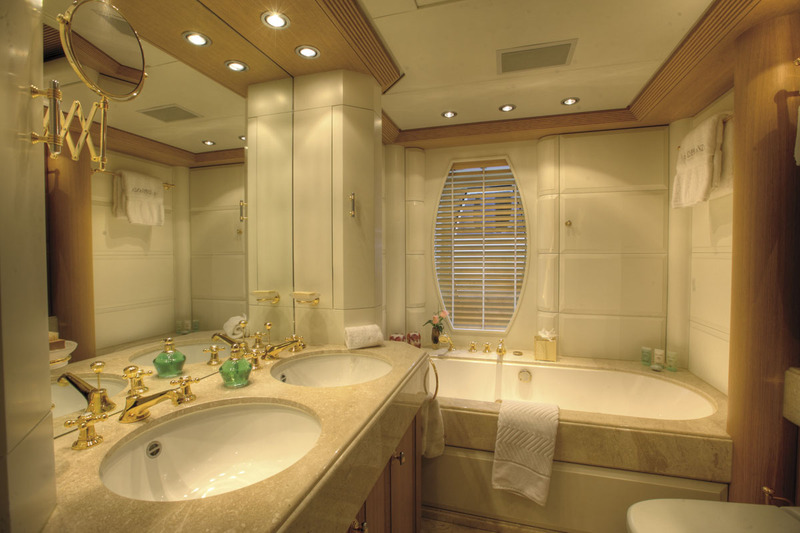 M/Y MARLA has a wide range of extra facilities and amenities on board for guests to enjoy including a fantastic range of tenders and toys such as: Two 18ft Nautica tenders (both tenders with 115 HP Yamaha engines. 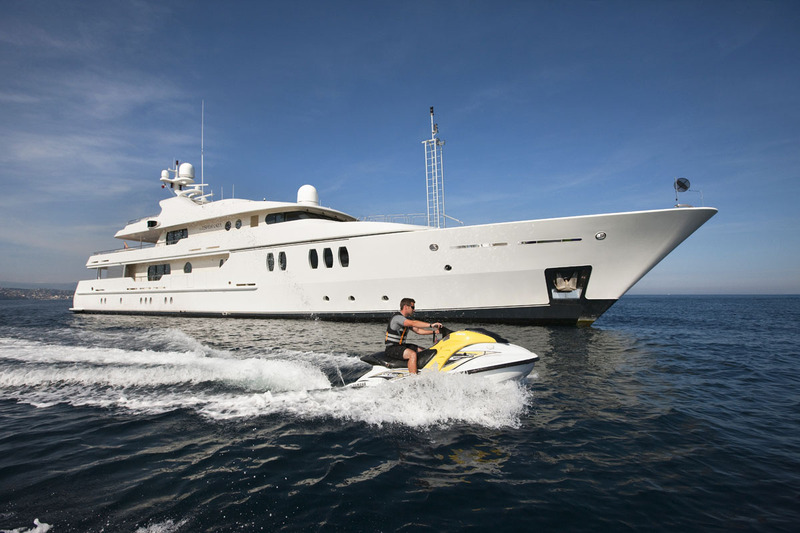 ), two jetskis a lazer sailing dinghy, two kayaks, two mountain bike, a windsurfer, 3 pairs of water skis and a single ski, 3 wakeboards, 8 single lilos, 6 sets of dive gear, snorkelling equip and plenty of towing toys such as donuts, Bananas, gyro tube etc. 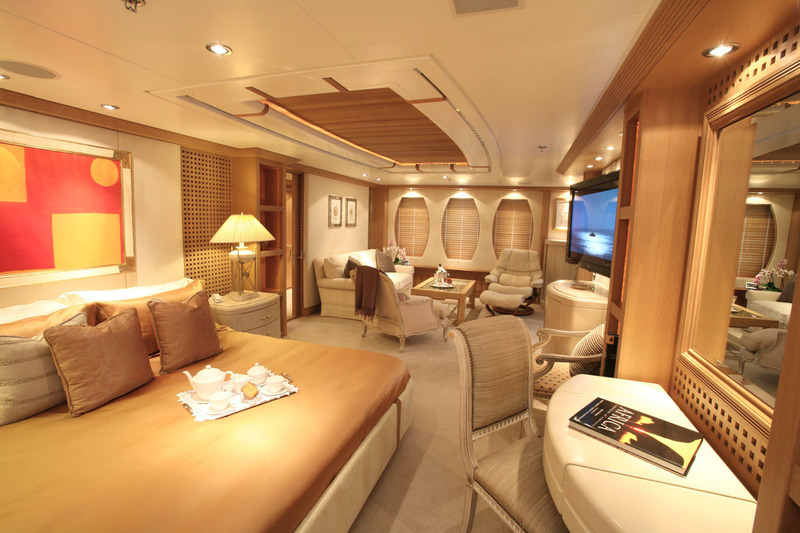 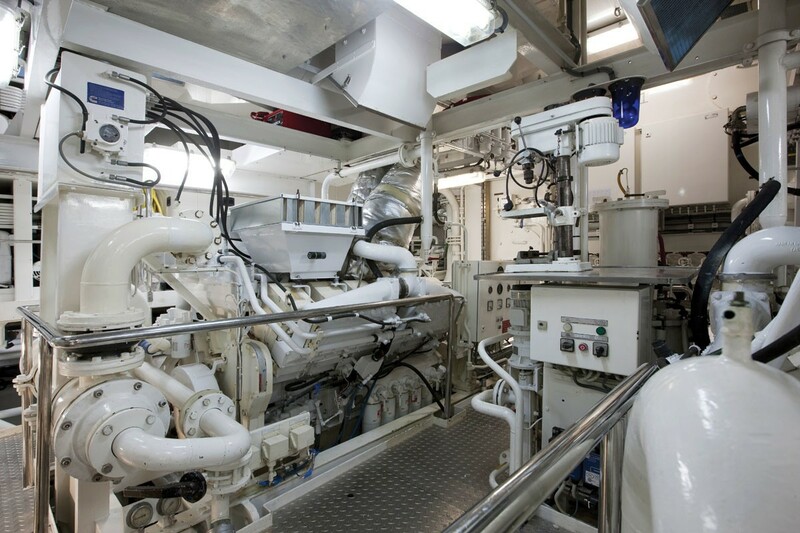 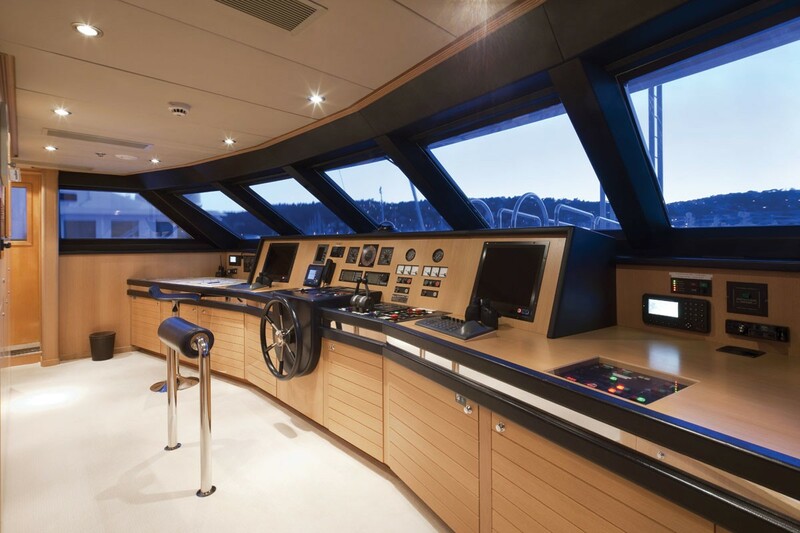 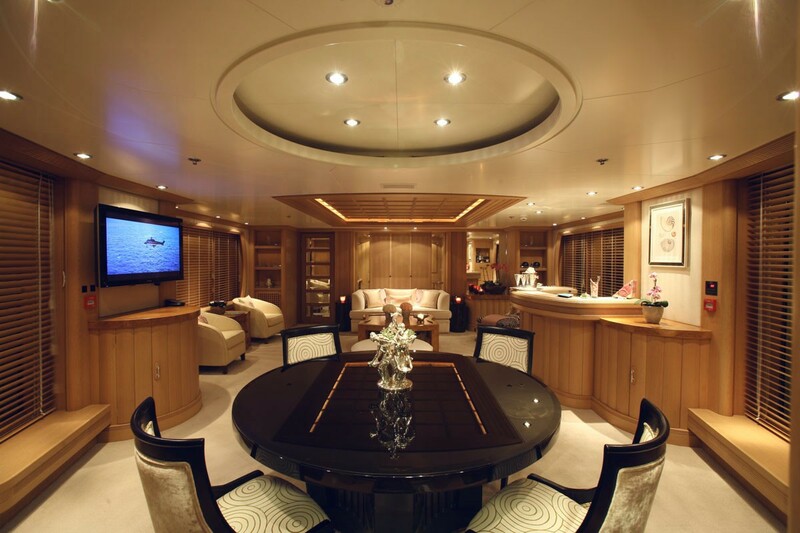 Audio Visual Equipment and Deck Facilities onboard include a Play station, and WII as well as WI FI throughout. 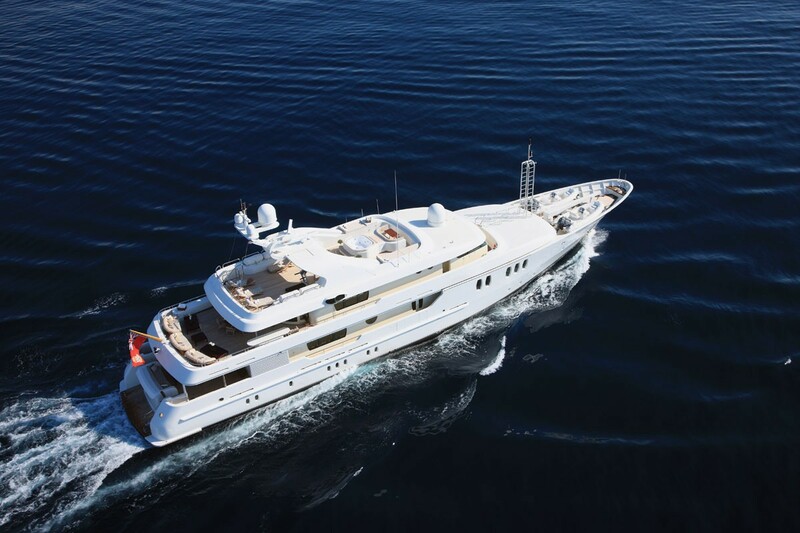 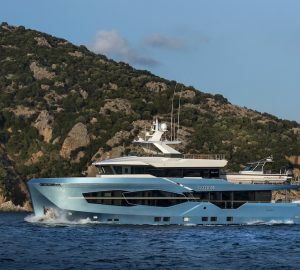 M/Y Marla is offering 10% discount for April & May 2019 Charters in Greece.